St. John the Beloved (Evangelist, Theologian): The figure seated to the right of Christ. Judas Iscariot the Betrayer: He is depicted leaning over the table and dipping into the dish (Matthew 26:20-25). Christ: Pictured on the left of the Icon, washing the feet of a disciple in a basin. Saint Peter: The chief disciple is depicted seated asking Christ to wash "not only my feet, but my hands and my head also." (John 13:9). The other disciples: Pictured loosening their sandals. Judas the lawless, having dipped his hand in the bowl with You, Lord, lawlessly put out his hand to take the silver. Having calculated the price of the nard, he did not scruple to sell out the One beyond price. Having put his feet forward to be washed, he gave the kiss of treachery to the Master, delivering You to the lawless. Cast out of the Apostles' circle, then casting down the thirty pieces of silver, he did not witness Your Resurrection on the third day, through which we have found mercy. Judas is indeed a child of that perverse generation, who ate the manna in the wilderness even as they murmured against the provider; with the food still in their mouths, an ungrateful people railed against God. Thus did the impious Judas, the heavenly Bread in his mouth, plot the betrayal of the Redeemer. What a grasping nature! What brutal daring! The One Who nurtured him he sold; the One he kissed he condemned to death. Truly this violent man was their offspring, and his fate, like theirs, was perdition. But Lord, deliver our souls from such inhumanity, for Your forbearance cannot be fathomed. When the glorious disciples were enlightened at the washing of their feet before the supper, the impious Judas was darkened by the disease of avarice, and to the lawless judges he betrayed You, the Righteous Judge. Behold, this man because of avarice hanged himself. Flee from the insatiable desire which dared such things against the Master! 0 Lord Who deals righteously with all, glory to You! Come, 0 faithful! Let us enjoy the Master's hospitality: the Banquet of Immortality! In the upper chamber with uplifted minds, let us receive the exalted words of the Word, whom we magnify! Filling Your cup of salvation with joy, 0 loving Lord, You made Your disciples drink from it. For You offered Yourself in sacrifice, crying: "Drink My Blood, and you shall be firmly established in the faith." Let us all draw near in fear to the mystical table, and with pure souls let us receive the Bread; let us remain at the Master's side, that we may see how He washes the feet of the disciples and wipes them with a towel; and let us do as we have seen, subjecting ourselves to each other and washing one another's feet. For such is the commandment that Christ Himself gave to His disciples; but Judas slave and deceiver, paid no heed. Receive me today, Son of God, as a partaker of Your mystical supper; for I will not reveal Your Mystery to Your enemies, nor give You a kiss as did Judas. But as the thief I confess to You: Lord remember me in Your kingdom. The service of Holy Thursday morning is dedicated exclusively to the Passover Supper which Christ celebrated with his twelve apostles. The main theme of the day is the meal itself at which Christ commanded that the Passover of the New Covenant is to be eaten in remembrance of himself, of his body broken and his blood shed for the remission of sins. In addition, the betrayal of Judas and Christ's washing of the disciples' feet are also central to the liturgical commemoration of the day. In cathedral churches it is the custom for the bishop, to re-enact the footwashing in a special ceremony following the Divine Liturgy. 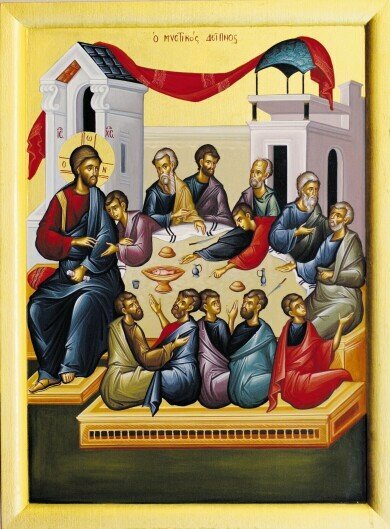 The liturgical celebration of the Lord's Supper on Holy Thursday is not merely the annual remembrance of the “institution” of the sacrament of Holy Communion. The very event of the Passover meal itself was not merely the last-minute action by the Lord to “institute” the central sacrament of the Christian Faith before his passion and death. On the contrary, the entire mission of Christ, and indeed the very purpose for the creation of the world in the first place, is so that God's beloved creature, made in his own divine image and likeness, could be in the most intimate communion with Him for eternity, sitting at the table with Him, eating and drinking in His unending kingdom. In a real sense, therefore, it is true to say that the body broken and the blood spilled spoken of by Christ at his last supper with the disciples was not merely an anticipation and preview of what was yet to come. In fact it was that what was yet to come - the cross, the tomb, the resurrection on the third day, the ascension into heaven - came to pass precisely so that men could be blessed by God to be in holy communion with Him forever, eating and drinking at the mystical table of His kingdom of which there will be no end. Since this Liturgy is usually celebrated on Thursday morning while many are at work or at school, those who are able, need to be there to represent those who cannot, whether they be other family members or parishioners in general. Use the hymns of the day for mealtime prayers, and as a focal point for reviewing the significance of this day. Use the ABOUT THE ICON section to help your children identify the individuals in the icon.